The article below was featured on the cover of Today’s Homes section of the Chicago Sun-Times near west edition on January 24th and far west edition on January 31st, 2013. The Home Builders Association of Greater Chicago presented Battaglia Homes with two 2012 Gold Key Awards for custom built homes in Hinsdale. What’s distinctive is that the awards were the latest in a string of three years of top honors for the custom builder. Each year the Home Builders Association of Greater Chicago (HBAGC) presents one of the premier housing programs in the country: “The Key Awards,” which signify quality in home building and remodeling. HBAGC has been honoring the area’s best since 1972 in such categories as new home construction, architectural design, room additions, interior design, green building and more. 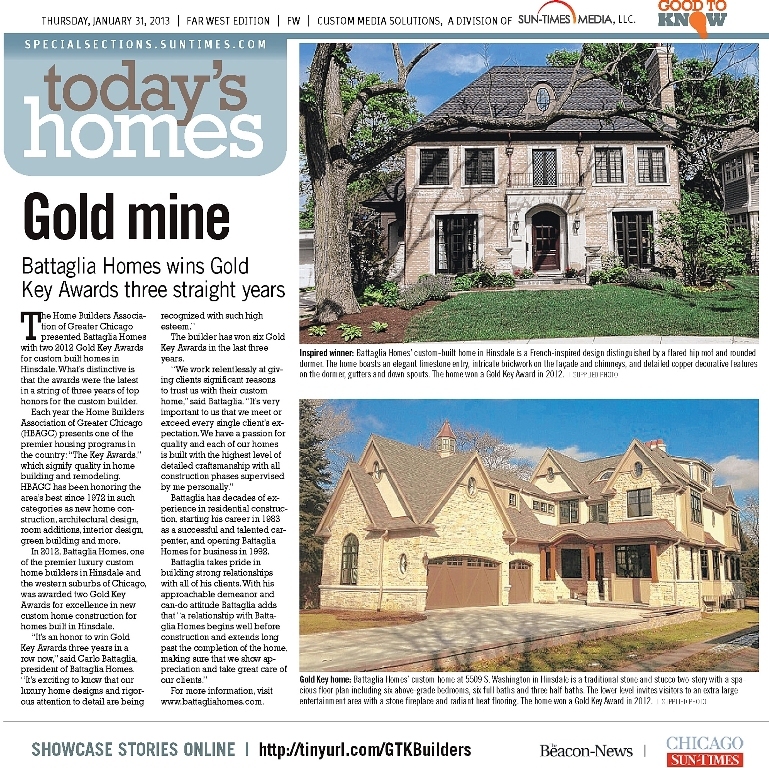 In 2012, Battaglia Homes, one of the premier luxury custom home builders in Hinsdale and the western suburbs of Chicago, was awarded two Gold Key Awards for excellence in new custom home construction for homes built in Hinsdale. The builder has won six Gold Key Awards in the last three years. Battaglia has decades of experience in residential construction, starting his career in 1983 as a successful and talented carpenter, and opening Battaglia Homes for business in 1992. For more information, visit www.battagliahomes.com. The article can be found online at the Chicago Sun-Times homes section.